McDonald's has released 2 McKids Adventures DVDs this month. They both have a list price of $14.98 and feature activities with Ronald McDonald. Apparently your kids aren't inundated with enough advertising messages from McDonalds, so these DVDs will serve to further sear the McDonald's brand image in their little brains. 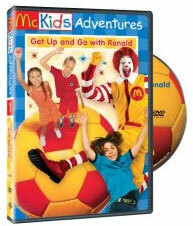 The "Get Up and Go with Ronald" DVD is an exercise video of sorts that is intended to get you kids active so they can burn off the fat from that Happy Meal they just ate! From DVD Verdict: "Okay children, it's time for another adventure with everyone's favorite corporate shill clown: Ronald McDonald! Ronald surrounds himself with a politically correct gaggle of kids who he dubs the "McKids" and together this gang goes on educational adventure. This time around, the McKids are going to soak up the joy of exercise!" And from the Amazon editorial review: "On the one hand, the DVD makes no mention of the company's cuisine. On the other, Ronald McDonald pops up every few minutes, so it's hard not to see this 30-minute program as a particularly insidious form of infomercial, regardless as to the rationale behind its creation." The other DVD is Treasure Hunt with Ronald. Again, from DVD Verdict's review: "So apparently Ronald McDonald hangs out with a group of fun-loving, ethnically diverse children who think nothing of following a grown man in bright yellow jumper and clown make-up to Egypt. They are the "McKids," and they are very happy to be here. When Ronald McDonald emerges from his closet, covered in explorer's equipment, the McKids get the idea in their heads to go traipsing all over the planet seeking out adventures." There are also a couple McDonald's branded toys available, too: the $20 McDonald's McKids Restaurant Play Tent (a tent that looks like a McDonald's restaurant), and the $99 McDonald's McKids Mega PlayPlace. This is nothing really new..
MC Kids, a videgame for the classic 8-bit Nintendo console. It came out in 1992, MC Donalds has been doing this sort of thing for a long time. Although I see your point now that I think about it. The DVD is supposed to be something healthy but will most likely just get the kids to want to go to McDonalds. At least the videogame never claimed to be anything but a videogame.